I was unhappy when I realized that neither Ben nor I packed our laptops because I really wanted to keep up with my travel food adventures while on the road. But thanks to the handy WordPress app for my iPhone, I think that I’m more connected than if I were just held to posting in the morning or night. Right now, we’re on our way to Portland, road snacks in hand, but still reminiscing about our spectacular dinner at the Harvest Vine last night. When I was doing research for this road trip, I found out that my favorite Seattle restaurant had closed down. Txori, a small pintxos bar in Belltown has been my go to place the past few years. For lunch and dinner, it was always a great place to go for small bites with incredible flavours. Unfortunately hard times forced the closure of Txori, but opened our schedule up to trying the same owner’s original restaurant, Harvest Vine. Harvest Vine is located in Madison Park, a 10 minutes drive from downtown. The restaurant is on the corner of the street and because it was a nice evening, they had all of their big rolling windows open. If you can, get a seat at the bar because not only do you get to witness the chefs work their magic, but they’re so quite willing to talk “food” with you as well. 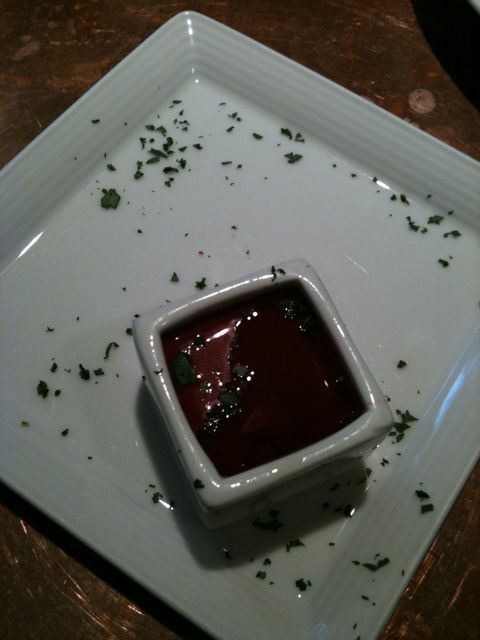 We started the evening with a beet gazpacho topped with Spanish olive oil amuse bouche. Wow, this velvety tiny taste was “pow” with flavour. It tasted like a perfectly sweet beet in liquid form, rounded off with bright notes of citrus and the smoothness of olive oil. At this point, I’ll apologize for the quality of photos for the evening. I forgot my camera at the hotel, so I was stuck with my iPhone. This photo is probably the worst of the evening as the gazpacho came out bright crimson red. Harvest Vine is not a pintxos bar, as most of their plates are raciones, meaning they’re one size up from a pintxos. Their menu holds pretty strong to their Basque origins and so many things looked delicious. I wished there were more than just the two of us to delight in this highly anticipated meal. We ordered two raciones frias, the Mousse de Pato and Lomo de Cerdo. Ben’s not really a fan of anything liver-y but I’m such a fan, it ends up in our meals more often than not. 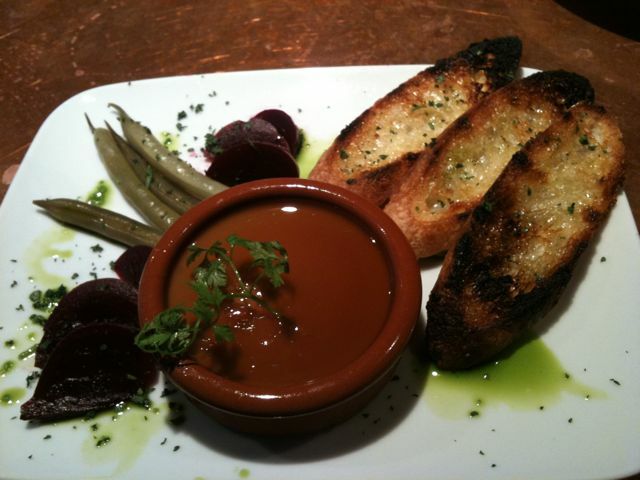 This plate of duck liver mousse with sherry gelee was light and rich at the same time. It reminded me of all the foie I ate when we were in San Sebastian, which put a smile on my face which wouldn’t be erased for the rest of the meal. 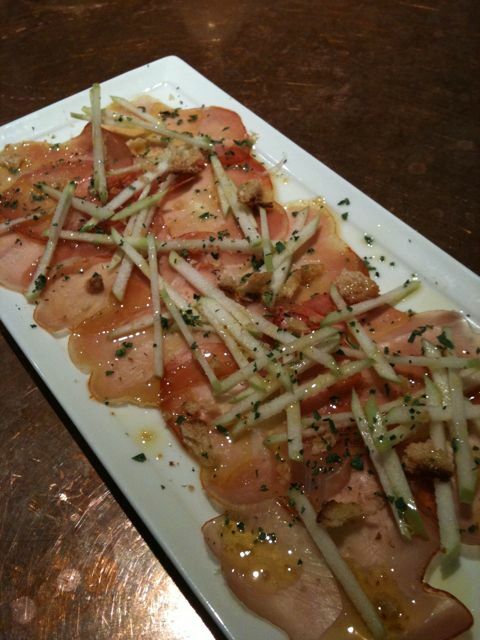 The Lomo de Cerdo, a cured pork loin with apple and toasted bread was a Ben choice. I liked the texture the crisp apple and toasted bread on top of the tasty lomo, but after my lunch of cured meats it was hard to list this as one of my favorites for the evening. Next up, Pimientos de Padron! 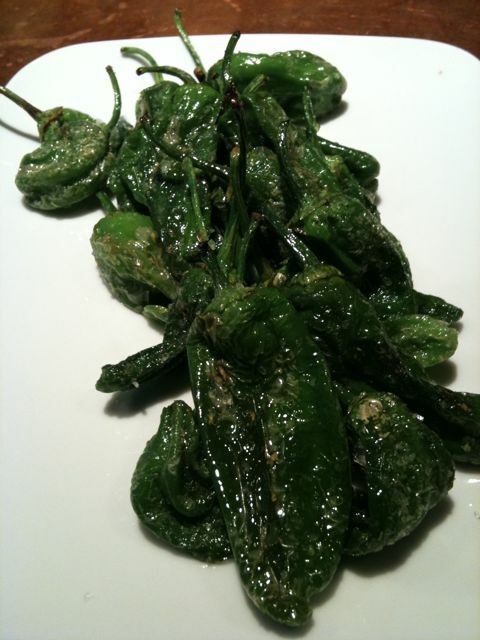 These fried Galician peppers were the reason I chose Harvest Vine as they were one of my favorite things at Txori. They’re only in season for a few months in the summer, so consider yourself lucky if you get them. Eating padron peppers is a bit like playing Russian roulette. Most of these small peppers are sweet but eaters beware, in a plate there are usually one or two which are spicy. In our plate, we had more than the usual number of spicy ones, but the degree of spiciness was less than usual. Our other green for the evening was the Espinacas. Ben gave me a look that I knew meant, “you’re ordering a plate of spinach?”. But I knew what he’d soon find out, this was no ordinary plate of spinach. 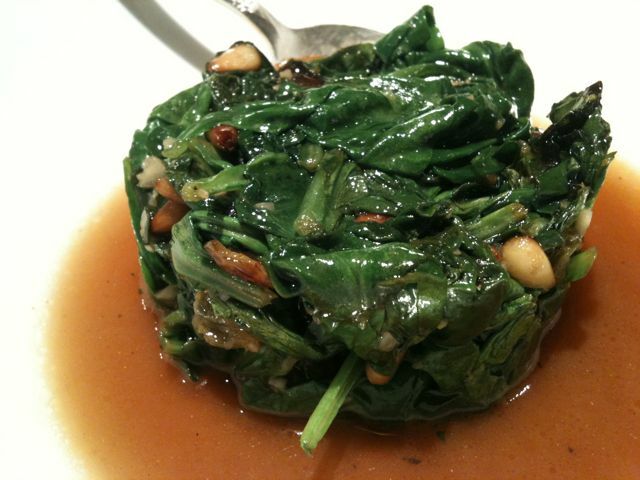 This was silky sheets of spinach sauteed with pine nuts, golden raisins and finished with cream sherry. People would eat more greens if they all tasted this good. Seeing as I chose most of the above dishes, I let Ben pick the meats. What we got were scallops and duck. The Vieiras were quicky sauteed and accompanied with spring onions and a romesco sauce. 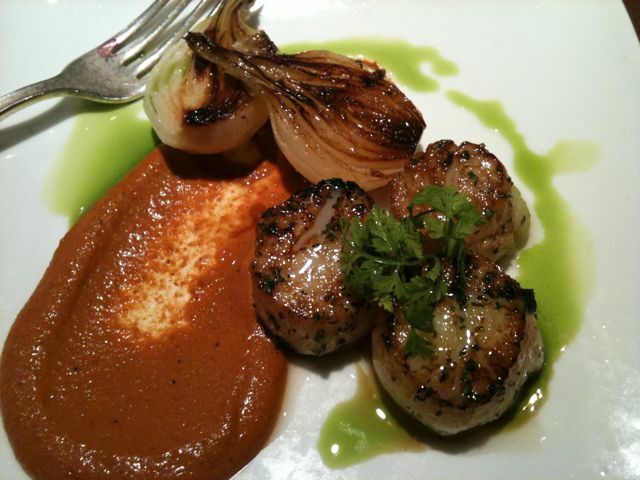 The sauce made with peppers and almonds was very smoky when eaten on it’s own, but complemeted the barely cooked scallops very well. The Pato Confitado wouldn’t have been my first choice, but I’m glad we got it. 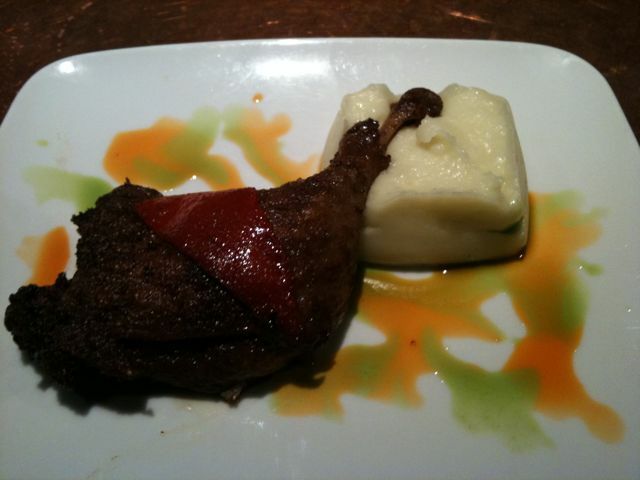 The skin on the duck was deliciously crispy and the meat just fell off the bone. The meat of the duck was salty, but when eaten in bitefulls with the smooth underseasoned potato puree, it resulted in Ben’s favorite dish of the evening. I’m pleased to discover that even though Txori has closed, that the Harvest Vine exists to satisfy my Basque food craving. Can’t wait to go back to explore the menu some more. mmmm … i’m really hungry now!